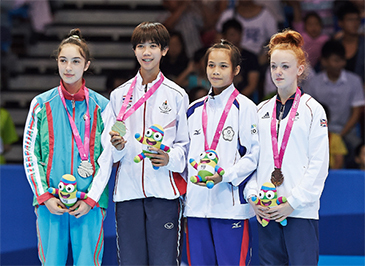 NANJING, China (Aug. 17, 2014) — Thailand and Iran grabbed one gold medal each on the first day of the taekwondo competition at the 2014 Youth Olympic Games in Nanjing, China on Aug. 17, 2014. In the women's -44kg weight category, Thailand's Panipak Wongpattanakit easily defeated Azerbaijan's Ceren Ozbek in the final match with a 12-point gap victory to earn her country the gold medal. Wongpattanakit led her final-match opponent 21-1 at the end of the second round of the final match. The Thai, the gold medalist at the WTF Qualification Tournament for the taekwondo competition of the 2014 Nanjing Youth Olympic Games in March this year, advanced to the final match as she beat Chinese Taipei's Zih-Ting Chen 8-1 in a semifinal match. "I am very much honored to win the gold medal. I really worked hard for the Nanjing Youth Olympic Games and I expected to clinch the gold," Wongpattanakit said shortly after the victory ceremony. Nat Indrapana, Thailand's member of the International Olympic Committee (IOC), presented the medals to the winners in the female weight division, together with Pimol Srivikorn, president of the Taekwondo Association of Thailand and a WTF Council member. The bronze medal in the female division went to Chinese Taipei's Chen and Great Britain's Abigail Stones. In the men's -48kg weight division, Iran's Mahdi Eshaghi brushed aside a stiff challenge from Chinese Taipei's Chen-Yu Wang to win the final match 17-9 for the gold medal. Eshaghi, the silver medalist at the WTF Taekwondo Qualification Tournament for the 2014 Nanjing Youth Olympic Games in March this year, reached the final match by winning a semifinal match against France's Stephane Audibert with a 12-point gap victory. He was ahead 16-0 at the end of second round of the semifinal match. Germany's Daniel Chiovetta and France's Audibert shared the bronze medal in the same weight category. The five-day taekwondo competitions of the 2nd Summer Youth Olympic Games take place at the Hall D of the Nanjing International Expo Center, drawing a total of 100 young athletes from 59 countries. Twenty international referees, 10 males and 10 females, officiate at the taekwondo competitions. The Nanjing taekwondo competitions feature five male and five female weight divisions, and matches of two weight categories are conducted every day. As part of the IOC-organized Culture and Education Programs (CEP), taekwondo demonstrations and taekwondo training sessions are offered for the visitors and spectators every day, and its opening ceremony took place in the afternoon on Aug. 17 at the Wanda Plaza.